If peak bloom falls on a week when there's no one at the school to appreciate it, does it make a sound? They say the composer Scriabin could see colors in music, so it's not farfetched to hear a fusion of rock and jazz in this blooming frenzy, a foretelling of what will emanate from the building just beyond it come September. 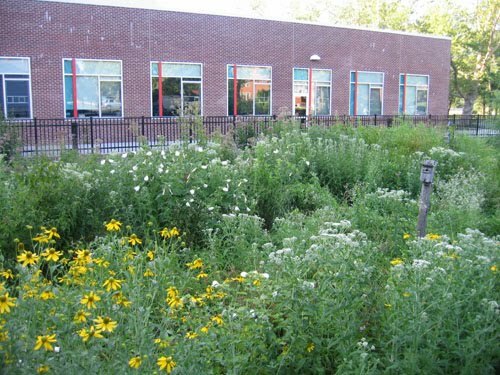 In full voice, for anyone passing by on Walnut Street, are Hibiscus moscheutos (white or pink), boneset and daisy fleabane (white), cutleaf coneflower, sunflower and black-eyed susan (yellow), cardinal flower (red), and pickerel weed (blue). 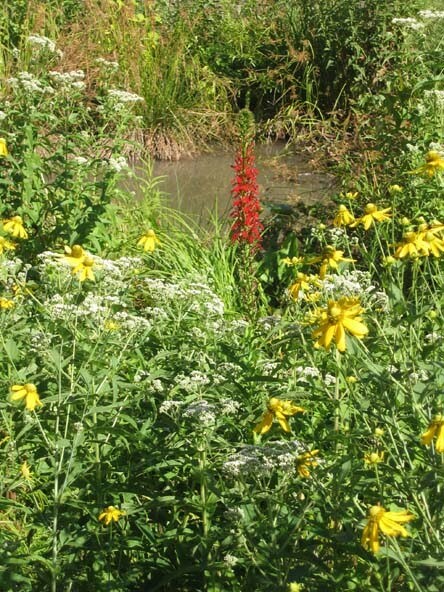 As any self-respecting pollinator could tell you, this is prime time for summer wildflowers down along the towpath between the D&R Canal and Carnegie Lake. 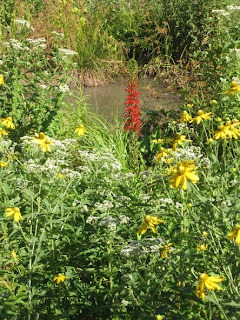 I'll be leading a wildflower walk there on Saturday, July 31, at 9:30 am. 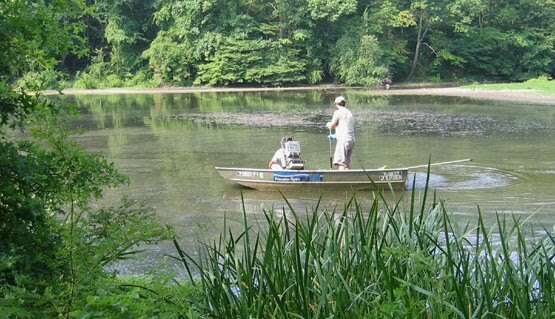 Background: The closeness of water and the mixture of sun and shade helps make the canal a linear refuge for more than 30 species of native wildflowers. Back in 2006, seeing the flowers getting mowed down as part of regular maintenance, I encouraged D&R Canal State Park staff to change their mowing regime between Washington Rd. and Harrison St. The result has been an abundant crop of diverse wildflowers to reward hardy Princetonians who stay in town through mid-summer. Meet on the canal towpath at Washington Rd. (not Washington St, which is in Kingston). Parking is available just to the south of the canal. Latecomers can find us heading downstream towards Harrison St.
Jim Consolloy (left), recently retired head of grounds at Princeton University, handed us a list of the ten trees he was about to introduce us to on a short walk along Williams and Olden Streets. Jim is gaining an encyclopedic knowledge of local street trees in the process of conducting a detailed inventory for the borough. The walk, organized by the Princeton borough shade tree commission, began behind Thomas Sweets Ice Cream, which provided 2 for 1 coupons to participants. My daughter liked the coupon aspect in particular, and also brought home some souvenirs. The large leaf comes from one of two cucumber magnolias known to be growing in Princeton. 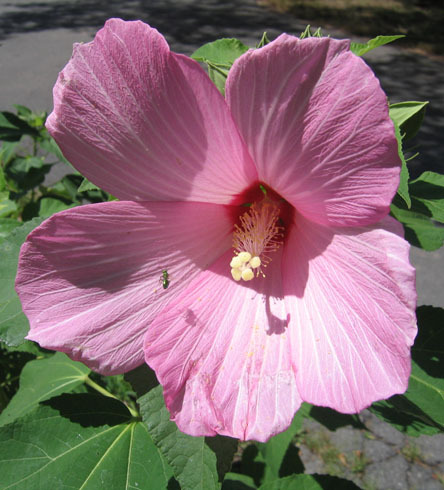 (A NJ native, the other specimen can be admired at Marquand Park.) 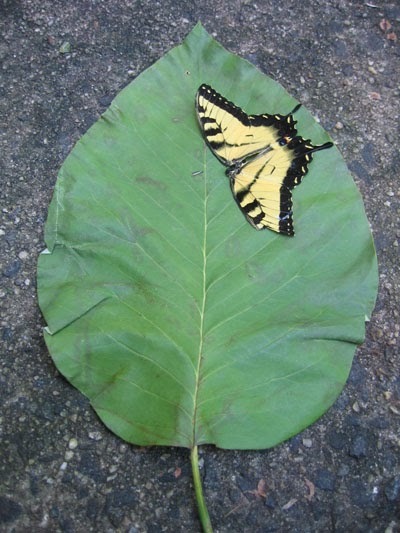 The tiger swallowtail had left its wings behind, as a kind of artistic legacy after donating its body to the food chain. In order, we saw an American elm, a London Plane Tree, Cucumber Magnolia, Tulip Tree, Willow Oak, Kashmir Cedar, Shingle Oak, Ginkgo, thornless Honey Locust, and little leaf Greenspire Linden. Just learned there will be a walking tour of trees tonight on the Princeton University campus and town. The tour will be led by Jim Consolloy, recently retired head of grounds at the university. 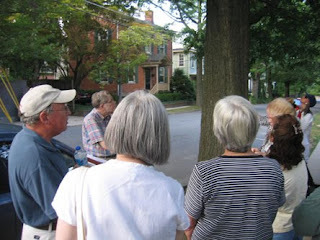 Jim has a wealth of knowledge, and is currently conducting an inventory of street trees in Princeton borough. Meet at 6:30 pm at the Williams Street Parking lot located just behind Thomas Sweet Ice Cream. The tour will last aprox 1 1/2 - 2 hours. Catfish and eels, catfish and eels. Wish they could tell us just how it feels, to have the water pulled out from over them. There had been doubts that the upper lake at Mountain Lakes, filled with 7 feet of sediment and only 6 inches of water, was still sustaining anything beyond minnows and and miniature sunfish. But on July 11, I stopped by the drained lake and found these foot-long catfish clustered just below a homemade dam. 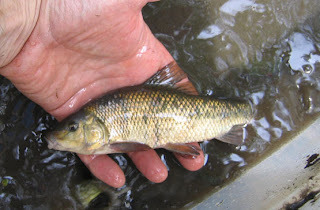 They had tried to escape the drained lake by swimming up one of the feeder creeks. 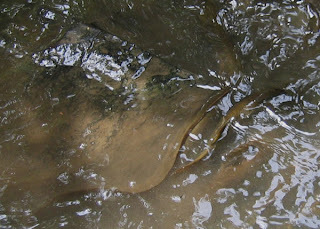 They were joined by a two foot long eel, whose long dorsal fin was visible through the glare. 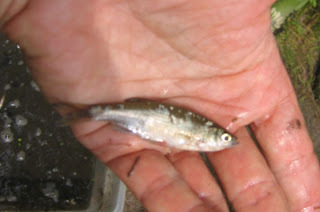 The previous week, before the lake was drained, workers from Princeton Hydro with a smelly generator and small flatbed boat had paddled around trying to shock and collect fish. 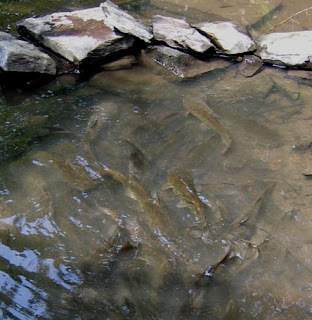 But a far more effective and cost-effective method was later demonstrated by neighborhood kids, who hauled bucket after bucket of fish out of the muddy, shrunken waters, to be carried off to private ponds or dumped in the lower lake, which has yet to be drained. 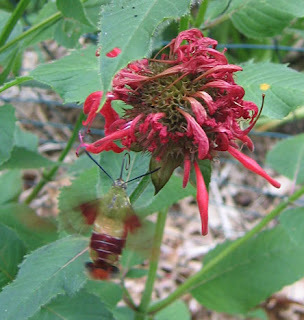 One of the most elegant pollenators to visit the backyard is a moth that looks and acts like a small hummingbird. These beebalm flowers, a bit wiped out by the heat, attract both the real hummingbirds and what looks to be the Hummingbird Clearwing Moth (Hemaris thysbe). They're also called hawkmoths, in the Sphynx moth family. 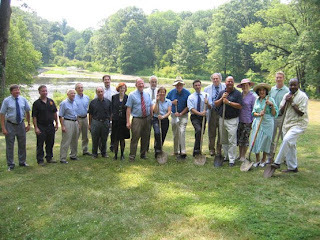 The official groundbreaking ceremony for the dam restoration at Mountain Lakes took place today. The photo includes township staff, elected officials, members of Friends of Princeton Open Space and the Princeton Historic Preservation Commission, consulting engineers, and the contractor who has agreed to take on all the work. Under the spreading hican tree (a grafting of a hickory/pecan hybrid to the rootstock of a hickory), John Mills hybridized past and present at his annual reading of the Declaration of Independence. 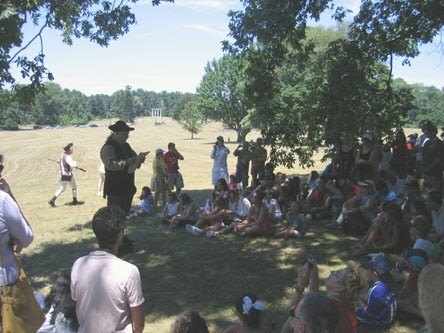 The reading, along with some shootings of cannons and cooking of colonial foods, took place as they always do on July 4 at Princeton Battlefield. Soldiers explained the difference between a musket and a rifle, and said the rifles' better accuracy made it possible for the colonists to pick off British officers--something the British took as a breach of their gentlemanly rules of warfare. The battlefield grounds now have a few new hybrids--four young chestnut trees that are 15/16th American Chestnut and 1/16th Japanese. The trees have three things going for them: a sunny spot to grow, the t.l.c. 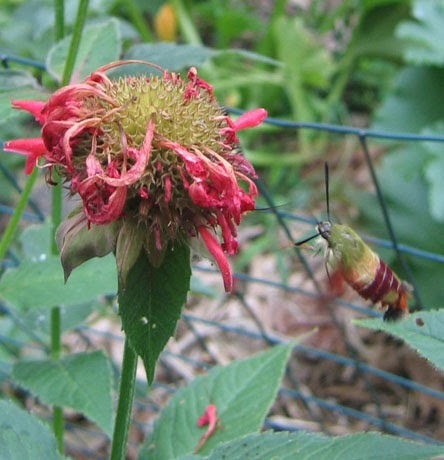 of Princetonian Bill Sachs, who planted them and is now keeping them watered through the extended drought, and immunity from Chestnut Blight that the Japanese portion of their genetic makeup will hopefully confer. 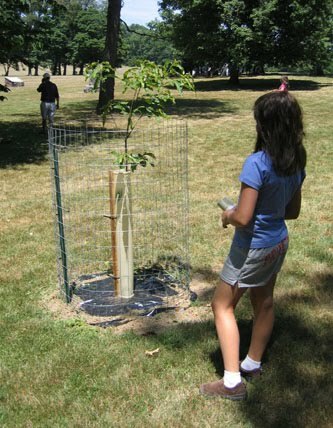 The trees are part of a larger effort to reintroduce native chestnuts into the American landscape. 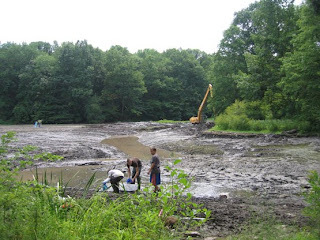 (You can read more about American chestnut tree reintroductions in Princeton by typing "chestnut" into the search box at the upper left hand corner of this blog. 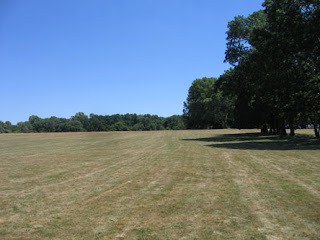 Being a promoter of habitat for wildlife, I was a bit chagrined to see that the battlefield meadow (back left in the photo), which is normally allowed to grow through the summer, has been mowed down. A long-range goal of the Friends of the battlefield is to restore a more authentic landscape, which would likely mean replacing some of the mowed grass with orchards and meadows. If you can take a break from keeping plants alive through this drought, come hear some freshly grown jazz compositions this Wednesday, 7/7 at 7pm. The Sustainable Jazz Ensemble will perform in the Princeton Public Library's community room--a great room for hearing live music. Since our debut there last summer, we've continued to add new original compositions. The latest crop has names like Riff in Z (composed in the rarely used key of Z minor), Cheery in Theory (which would make a good title for a book on overly aggressive ornamental plants that look great in the garden until they start taking over), and The Caged Bird Swings (with apologies to Maya Angelou, a tune I wrote in 1984 that traces a confined musical theme's escape to freedom). The band features Phil Orr on piano, Jerry D'Anna on bass, and me on saxophone. I call it sustainable because the music is all locally grown, with notes that have been used before, albeit in a different, even fresh, order and rhythm. No virgin timbres were harvested in the making of this music.